I still have them. 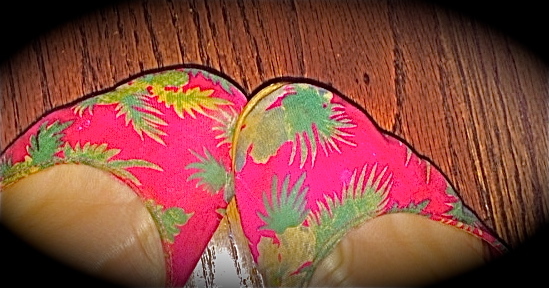 A pair of hot pink ballet flats with a tropical theme. Glancing at the pair, you might never guess where I purchased the flats, the answer being London, England. I, on the other hand, have a very different experience each time that I glance at the pair. With only a look, I’m immediately transported back to my first-time visit to Europe, and, in the blink of an eye, I can see myself, along with my mom, dad and twin sister, walking through the aisles of Harrods and walking into boutique shops along London’s famous streets. It’s been more than 25 years since I excitedly purchased my tropically themed ballet flats, and the pair has survived many changes in my life, always landing safely inside my closet space, never being thrown away. Like the photographs that I keep from that inaugural trip to Europe, my ballet flats seem to capture a point in time in my life that no longer exists. Or does it? Could it be that the same excited teenage girl who purchased those ballet flats still remains within the woman who I have become? I think the answer to that question sounds softly from within my closet. Though older now, and a bit more worn, my hot-pink “London shoes” not only still exist – they, in fact, still fit. What about you? Are there any parts of you that you’re afraid to lose? Which aspects of you are for safekeeping?